Key Perspectives: dawn of deep ecology; neglected dimensions; ecology of consciousness; integral aim. The concept of Sustainable Development is now universally accepted by all development thinkers. However in a more integral perspective, the present concept and vision of sustainability is not complete because it doesn’t include all the dimensions of human development. Attunement with physical Nature, which is the aim of modern ecology, is not sufficient for integral sustainability. There must be a similar attunement in the social, psychological and spiritual dimensions of human and terrestrial existence. This article is a reappraisal of the concept of sustainability in the light of an integral spiritual vision. Since the advent of the Industrial Revolution, and for a long time, the process of development was equated with economic development powered by technological progress and measured purely in terms of economic indicators like Gross National Product or per capita income. But the serious problems engendered by this one-sided vision of development in the ecological, social and psychological dimensions of life led to a radical rethinking among economic and development thinkers on the concept and aims of development. This new generation of development thinkers, deeply influenced by the ecological and humanistic paradigms, started asking some crucial and relevant questions like for example, development of what and for whom? Whether techno-economic progress measured by economic indices has created a proportionate increase in the well-being and quality of life of people? One of the central concepts of eco-development or deep ecology is the concept of sustainability or Sustainable Development. Introduced by environmentalist, Lester Brown in 1981 and promoted ever since in the World Watch Institute’s annual reports, the idea has gained wide acceptance among the Green movement and in the emerging development debate. To put in simple terms, sustainable development is defined as a path of development, which can meet the needs of the present generation without compromising the ability of the future generation to meet their own needs. The other aspect of sustainable development is renewability of resources, which means all the resources needed for development have to replenished. From the integral perspective, the concept of deep ecology and sustainable development raises some important questions and issues, which remain vague, unclear and unresolved in the modern environmental movement. First of all, the concept is focused mainly on physical, economic and environmental resources. But if Man is part of Nature, then the sustainable development of “human resources” and whatever “resources” or energies within the human being have to be part of a synthesis of ecology, environment and human development. But a human being is not merely a physical entity. We are conscious being with a psychological, moral and spiritual dimension to our existence. In our collective life we are part of a social and cultural environment, which is the collective outer expression of our inner being. The concept of sustainable development cannot be complete without including and integrating these non-material dimensions of our life and consciousness with our ecological and economic concerns. Thus there is something like social, cultural, psychological and spiritually sustainability, which depend mostly on our values and ideals, not merely professed in thought or speech, but lived in action. For example, a society or civilization driven predominantly by greed or indulges in a meaningless multiplication of its material and vital desires without the restraining and refining influence of some higher values will soon find its vital energies exhausted. Similarly, when the spiritual aspiration and values are denied or suppressed it will lead to every form of psychological and social disorders and conflicts. The eminent psychologist Carl Jung has said that many of the psychological problems faced by his patients are due to suppression of the religious urge by the modern western culture. “It is found that civilization has created many more problems than it can solve, has multiplied excessive needs and desires the satisfaction of which it has no sufficient vital force to sustain, has developed a jungle of claims and artificial instincts in the midst of which life loses its way and has no longer any sight of its aim.” (2). But ultimately even physical sustainability depends on psychological factors. When we examine deeply the inner causes of present environmental problems, we will find that they are problems, created by flawed life-styles, values and a world-view which values material comfort, success and enjoyment over all other higher ideals. When the values which guide our lives are skewed, we spend our money and resources not on the real needs of our sustenance and growth, inner and outer, but wastefully on frivolous non-essentials or on things which are harmful to our own development and to the environment. As a wise mom sums up the essence of the problem in a letter to her daughter: “It is my observation that too many of us are spending money we haven’t earned, to buy things we don’t need, to impress people we don’t like.”(3). We are not in any way underestimating the importance of the more material and short-term solutions, like for example in the domain of technology, law and regulation. When the survival of the planet is at stake in the near future, material and short-term remedies are as important as the moral, spiritual and the long-term solutions. Moreover short-term and the long-term or the material and spiritual solutions are not mutually exclusive. They can be pursued simultaneously. “I maintain that the human mystery is incredibly demeaned by scientific reductionism with its claim in promissory materialism to account for all the spiritual worlds in terms of patterns of neuronal activity. This belief must be classed as superstition—- we have to recognize that we are spiritual beings with souls existing in spiritual worlds with bodies and brains existing in a material world. (4). “Now there are two ways in which one could approach the issue whether God has an influence on Nature. One is to continue following the traditional, materialistic line of explanation, seeing if it really explains everything. That would be a very long job. It might be couple of centuries, perhaps, we would get the answer that way. An alternative approach for the scientists to say ‘Let’s investigate the opposite view, that perhaps we should be taking God into account in science; what would a science look like which had God in there playing a part, accounting thereby for particular phenomena.” (6). Why not the science of ecology and the environmental movement explore this alternative approach suggested by the Nobel Laureate scientist? But the success or effectiveness of this alternative approach depends on the concept of God on which it is based. If we consider God as an extra-cosmic creator sitting in some remote heaven and creating or overseeing the Universe, it may not lead to any positive scientific results. On the other hand if we conceive Man, God and Nature in the eastern spiritual perspective, then it can give an entirely new and higher orientation to modern ecology and environment. In this eastern perspective God is the infinite, eternal and universal Consciousness which is the creative source of the Individual and Universe, Man and Nature. He is the deepest and innermost Self of our own being and the universe and in which we can feel our unity with all creation. Nature is the creative Energy of God and the source of all energies in the Individual and the universe—physical, psychological and spiritual. Thus God in this conception is the spiritual Unity and Wholeness—Unity of Being, Unity of Consciousness and Unity of Energy—which sustains all creation. This brings us to the aims of sustainable development. The aim of modern environmentalism seems to be perfect attunement of the outer life of man with the ecological laws of physical nature. This is a perfectly legitimate aim for the development of the material and economic life. But is this the highest aim of human development or human consciousness? Why should the growth of human consciousness be tethered to the laws of physical Nature? The development of our consciousness, or in other words, our psychological and spiritual development, has to be in harmony with the laws or ecology of the higher non-physical and more conscious realms of Nature which may not follow the laws or ecology of physical Nature. There may be a certain amount of correspondence between the laws of the various dimensions of Nature. 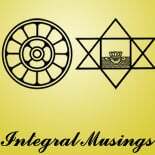 For as the ancient Vedic sages of India perceived there is an essential unity and correspondence between the laws of the different planes of existence. In this Vedic conception, according to Sri Aurobindo “—it is one Law and Truth acting in all, but very differently formulated according to the medium in which the work proceeds and its dominant principle. The same gods exists on all the planes and maintain a different aspect and mode of working and to ever wider results.” (7) So a clear understanding of the laws of ecology of physical Nature provided by modern science, can throw some luminous clues for a better understanding of the laws of the supraphysical realms of Nature in the domains of consciousness. But correspondence does not mean similarity and sameness. Laws of consciousness and inner development of the human being in the realms of consciousness cannot be the same as that of physical Nature and outer development. When we undertake this deeper study with the same amount of scientific rectitude with which modern science has examined physical nature, we may perhaps find that moral and spiritual values discovered by the higher wisdom of humanity has the same significance as the laws of physical Nature discovered by modern scientific ecology. Ethics and Spirituality are part of the inner ecology of our moral, psychological and spiritual nature or in other words the ecology of consciousness. Just like the quality and sustainability of outer life depends on attunement with the ecology of physical nature, quality and sustainability of our inner life depends on attunement with the ecology of the psychological and spiritual dimensions of Nature. Capra, Fritjof, (1995), ‘The Challenge’, Steering Business Towards Sustainability, ed: Fritjof Capra and Guntur Pauli, New Delhi, Response Books p.3, 6. Sri Aurobindo, (1972) Collected Works, vol.15, Human Cycle, Puducherry, Sri Aurobindo Ashram, pp. 228. Singh.T, ‘Vedanta and Science’, Savijjnam, Scientific Exploration of a Spiritual Paradigm, vol-1, 2002, p.51-65. Capra, Fritjof, (1995), ‘The Challenge’, Steering Business Towards Sustainability, ed: Fritjof Capra and Guntur Pauli, New Delhi, Response Books p.3,6. Josephson B.D, ‘Science and Religion: How to Make a Synthesis’ Seven Noble Laureates on Science and Spirituality, ed. T.D. Singh, New Delhi, Bhakthi Vedantha Institute, pp.15-21. Sri Aurobindo, (1972) Collected Works, vol.16, Supplement, Puducherry, Sri Aurobindo Ashram, pp. 228.